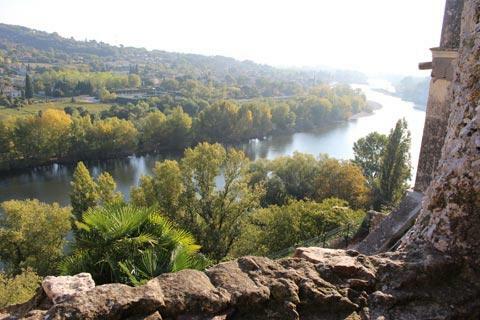 Aigueze is in the north-eastern corner of Languedoc-Roussillon, to the north-west of Orange and Avignon and on the border with the Ardeche department (Rhone-Alps region). 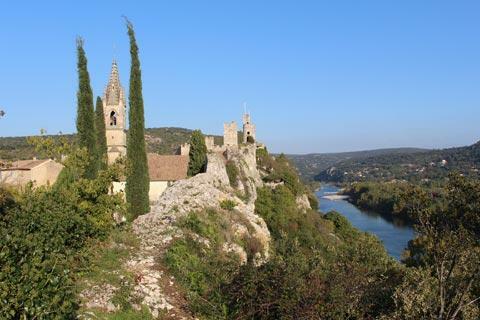 The village stands high above the gorges of the river Ardeche which is crossed here by the Saint-Martin suspension bridge constructed at the beginning of the 20th century. Aigueze is a small, very pretty medieval village that originally developed around a castle - the ruins of the castle still dominate the skyline of the village with the river and small cliffs below. 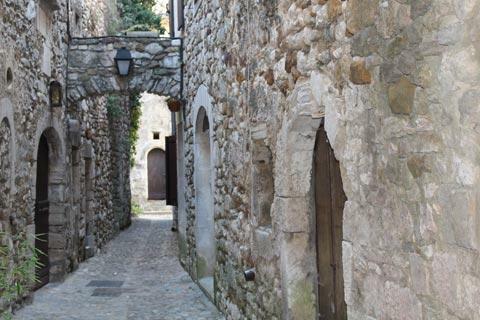 The centre of Aigueze has been pedestrianised and paved in recent years while maintaining and enhancing the charm of the ancient houses. France This Way comment: the village is very picturesque, and although it perhaps lacks the charm of the best of the 'most beautiful villages of France' the views across the river and along the cliffs and castle are exceptional and a visit is highly recommended. 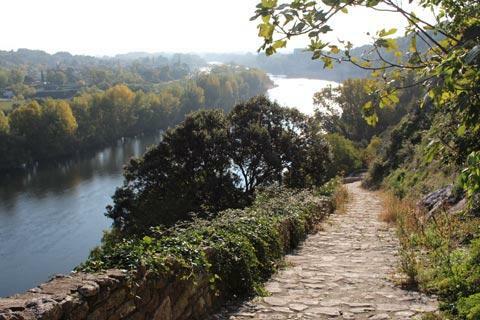 Simply strolling around taking in the medieval atmosphere of Aigueze and the views across the river valley is the great pleasure of a visit: although it is small and doesn't take long to explore it is charming and you will have plenty of time to sit around in one of the cafes! There are also some individual points of interest as you explore. 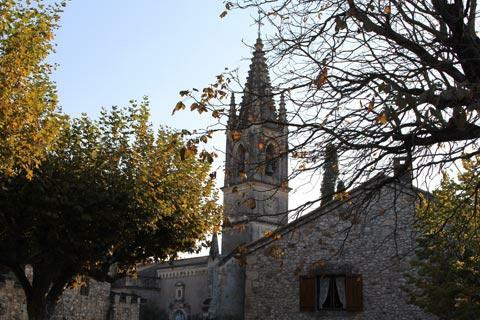 Start your visit in the picturesque square in the centre of the village in front of the church of Aigueze. There are actually two different linked squares here: the Place de l'Eglise with the church and the Place Jeu des Paumes with cafes, shady trees and where the market is held. 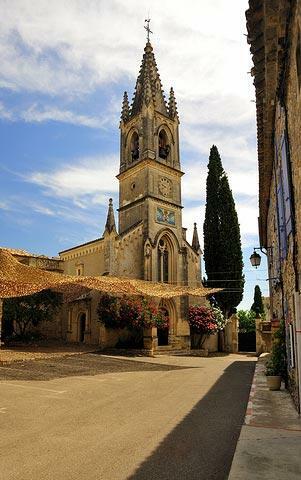 The Church of Saint-Pierre has very ancient origins dating at least in part from the 11th century. The inside of the church is the highlight, with brightly coloured frescoes and decoration covering most of the walls and ceilings and making it lovely and bright. Along Grand Rue and in the surrounding paved streets you can see an ancient vaulted passageway and discover numerous ancient houses, some renovated and others appearing unchanged for hundreds of years. 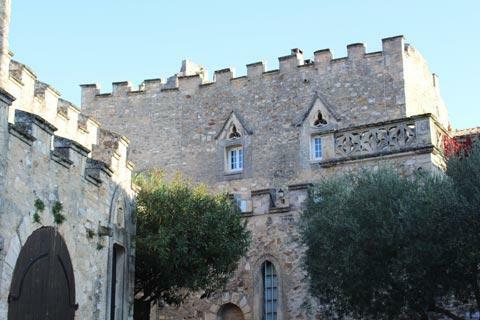 You can also see an old olive oil mill in the village. 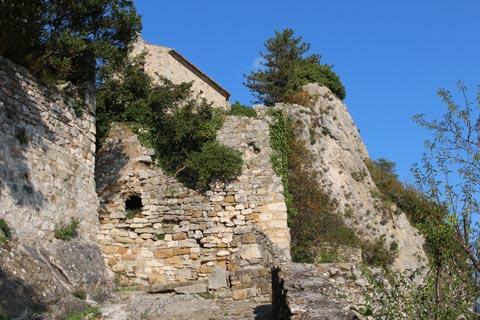 After exploring the centre of the village stroll along the path that leads to the remains of the castle donjon. This is perched high on a rocky ledge and also has lovely views across the valley. 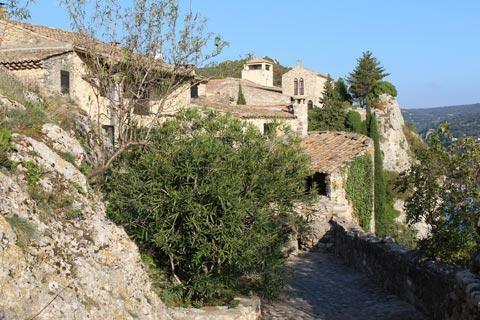 You can find lovely views across the valley, river and castle from in the centre of the village but also by following the clifftop paths a few hundred metres in either direction outside the centre of Aigueze - this is probably the highlight of your visit. All this walking around in the heat and sitting in cafes will have exhausted you (!) so time to head for the river. 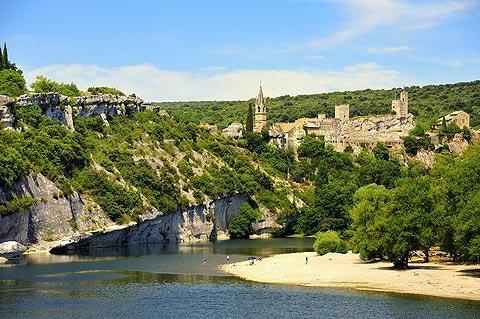 Below Aigueze on the Ardeche river there is a popular small river beach, reached via Rue de l'Escale, and as well as the chance to cool off this is also one of the best place for views that enable you to appreciate the setting of the village. 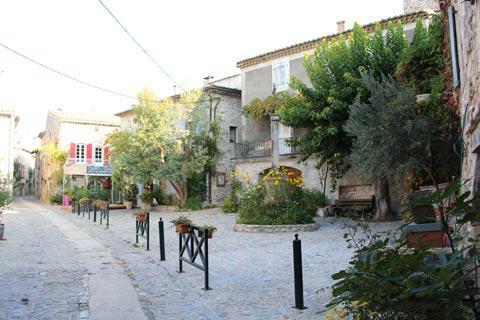 Aigueze is also one of only two classified 'most beautiful villages in France' to be found in the Gard department (the other, close by, is La Roque-sur-Ceze). 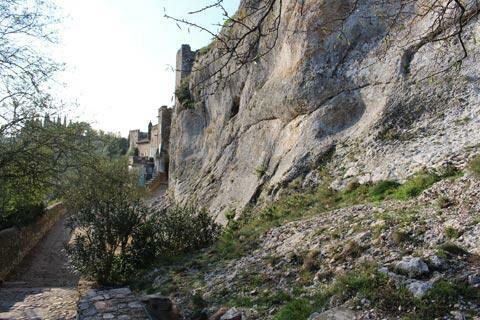 The location of the village is also excellent for exploring the Gorges de l'Ardeche, one of France's greatest natural highlights, as well as several other very picturesque villages - you get a good feel for the surrounding countryside from within Aigueze itself, since both sides of the rocky promontory on which the village stands offer far-reaching views. 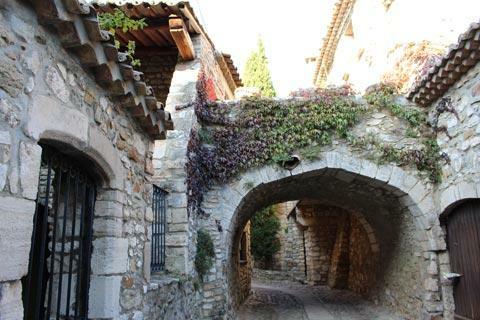 You might also be interested in the Ardeche villages of character - being across the border into Gard disqualifies Aigueze from being included but several are close by and share characteristics and architectural style with Aigueze: see Ardeche villages for details.